Construction accidents happen more frequently than we would like, and taking precautions is always advised. However, even with precautions, accidents will still happen. Any party involved in a dispute regarding a building project, whether residential or commercial, should consult with the Law Office of D’Ann Hinkle before proceeding with their case. A personal injury attorney in Houston can help you understand the next step you’ll need to take. If you are in need of an attorney for any of these types of accidents, contact the Law Office of D’Ann Hinkle today. Damages may be attained for your injuries from the store owner, the project manager, or others found liable. They can help pay for lost time from work, medical expenses, and emotional or psychological support. D’Ann Hinkle works with clients at all stages of your case, and will fight for your compensation rights for any financial or physical damages. There are strict deadlines on construction claims that must be followed exactly, or you could end up with serious issues. The stress of all the paperwork and deadlines is not something you should concern yourself with, let our trusted law office help you handle what is important to you. 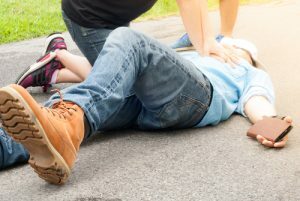 Whether it was you or a loved one injured in such a case, consulting with a personal injury attorney in Houston will help you to gain the most compensation. The peace of mind you get from your consultation can help you to continue recovering and living the rest of your life. The Law Office of D’Ann Hinkle has over 20 years of experience with these types of cases. Contact the office today to schedule your consultation and discuss the next step for your case. D’Ann Hinkle’s advice for you will help you to know you’re in good hands.